Tim Bresnan was drafted in as a "horses for courses" bowler but ended up hailing the greatest day of his Test career after he blasted through Australia's top order to drive England towards Ashes triumph on Tuesday. The 25-year-old paceman, who replaced the youthful Steve Finn, took the scalps of Shane Watson, Ricky Ponting and Mike Hussey after tea to spark a collapse that saw Australia limp to 169-6 at stumps on day three of the fourth Test in Melbourne. With the hosts still 246 runs from making England bat again, the tourists need only capture the remaining wickets with two days' play to seal the Ashes on Australian soil for the first time in 24 years. "I think it would be (my best day). Obviously (I'm) ecstatic, over the moon," the Yorkshireman told reporters. "There's a lot of words that could describe it, most of them I couldn't repeat in a press conference," he joked. Bresnan, whose last stint in England's Test side was against Bangladesh at Lord's in May, finished with 3-26, his best bowling figures, continuing England's success in the series with their replacements. Chris Tremlett was England's stand-out in the second Test at Perth after coming in for the injured Stuart Broad. Bresnan also toured Bangladesh in March, where he said the subcontinent's dry decks had given him a good reference for Melbourne where the pitch suited his skills with reverse swing. Teamed with James Anderson, who dismissed all rounder Steve Smith and Tremlett, who deserved a wicket after asking questions of the batsmen all afternoon, the pace trio's performance on a relatively lifeless wicket stood in contrast to Australia's toil throughout the match. 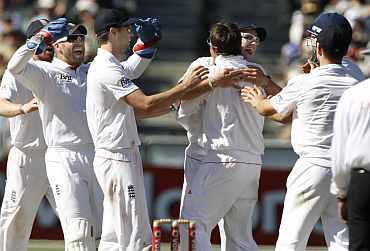 The hosts struggled to dismiss England for 513, leaving a massive 415 deficit for their batsmen. 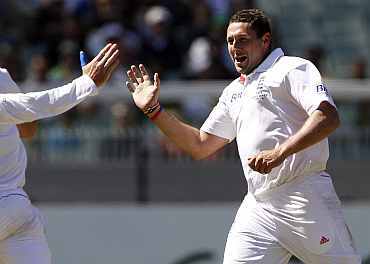 "You go around the world and you get these wickets and you're expected to do the job on them," Bresnan said. "You use the conditions you get given... Today, the pitch wasn't doing a great deal, we had to rely on the skill, and with the abrasiveness as well, reverse swing came into play. "We've bowled well as a unit again, bowled in partnerships, so it doesn't matter who really takes the wickets, it just happens today is my day," he added. Bresnan conceded England's bowlers had one trump card in their corner, in the form of Australian bowling coach David Saker, who spent six years as an assistant coach of state side Victoria, who call the Melbourne Cricket Ground home. "He's got quite a lot of experiences in Australian pitches, especially here. He said it's going to do this the first day and do this towards the end of the game." "He's been spot on apart from saying that it might spin a lot more than it has," he added. 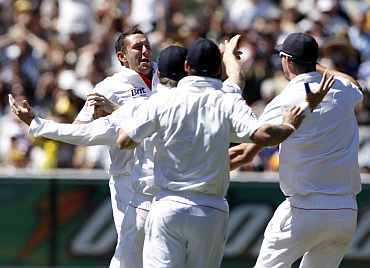 Bresnan said he thought the chance to seal Australia's Ashes fate in front of a crowd of more than 68,000 had brought out his best. "I do like being under the pump... I do like the big occasion, and I do like being under pressure, so why wouldn't it be on Boxing Day in Australia?"